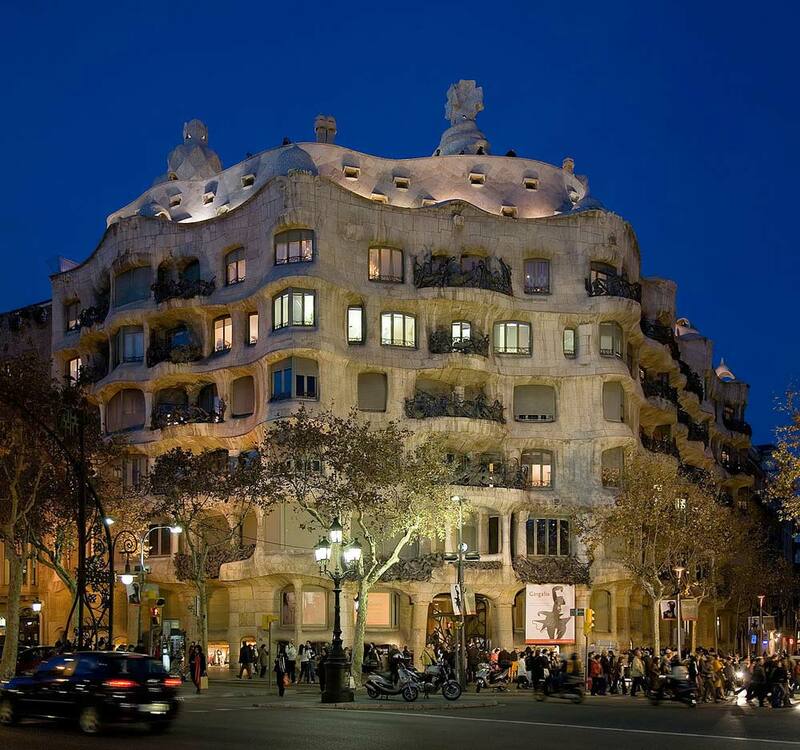 The Casa Milà, also referred to as La Pedrera or The Quarry, is located in Barcelona, Spain. It was designed by the architect, Antoni Gaudí. A wealthy businessman, Pedro Milà i Camps, was impressed by an expressionist building that Gaudí had designed, the Casa Batlló. He commissioned him to design the apartment building in the Eixample area of the city. Construction of the building started in 1906, and was completed in 1912. At that time, the design was marked by controversy because of its bold styling. Today, the building is the Fundació Catalunya-La Pedrera headquarters. Additionally, it is a cultural center for a number of different activities that the organization sponsors. The CatalunyaCaixa Foundation manages all of the activities and the building is open to the public. The structure is made completely with natural stones and does not have any straight lines. The Casa Milà rests on several arches and pillars that have different heights. Other innovative features include the underground parking garage, as well as separate elevators and stairs for owners and servants. The building features two central courtyards, one oval and the other circular. This enabled most of the rooms to have some amount of sunlight. The layout looks like an asymmetrical “8” due to its size and shape of the two courtyards. The building consists of two separate houses that are connected by the ground floor, roof and facade. Each house has its own separate entrance and courtyard. The Casa Milà has nine levels and the main floor was the Mila’s residence. The rest of the area was used to build twenty rental apartment homes. Steel was used to create the irregular floor plans. This construction made it possible for the removal of any of the walls without affecting the building’s overall stability. This gave the owners the ability to remodel the interior area without experiencing any major construction problems. The apartments featured plaster relief ceilings, handcrafted furniture, wood doors, and windows. The attic had a laundry utility room that had drying areas. The rooftop area also served as an insulating space for the structure. It has many skylights, staircase exits and fans. The exterior of the building has undulating balconies that resemble waves. The windows and balconies have wrought iron ornamentation and a stone facade which were created by Josep Maria Jujol. He also created a number of the plaster ceilings. Some individuals view the facade as resembling cliff-like caves. Areas open to the public are the attic, rooftop and top floor. The top floor apartment gives visitors an idea of what the interior looked like at the start of the twentieth century. The interior, like the outside, has no straight lines. Rooms were created with a blend of Art Nouveau and expressionist styles. There is a Gaudí’ exposition on display in the attic area. A very interesting area of the Casa Milà is the rooftop terrace. It features a range of colorful surrealistic chimneys. Many chimneys were coated with limestone and broken glass or marble. They have emerged as real sculptures that are integrated into the overall building design. Some of them resemble warriors from a science fiction film, while others appear more whimsical. The roof terrace also includes a bench much like the one found at the Parc Güell. The top of the building offers a wonderful view of the Eixample district. After Gaudí died in 1926, the owners disposed of most of the furniture that was created by the architect and made many changes to the interior decoration of the building. When Spain’s Civil War started in July of 1936, the Milàs had to flee the area but did manage to save some artwork. They returned to their home after the war. Pere Milà died in 1940 and in 1946, his wife, Roser Segimon, sold the property. She continued to live in her home until she died in 1964. Casa Milà was in very poor condition by the early 1980’s. Previously, it had been painted a dismal brown color and several of its interior palettes had been changed or were badly deteriorating. After the building became a World Heritage site in 1984, it was restored and many of its original colors were revived.